You've framed your query too narrowly. What you really want to know about is progress in bird-scaring technology. This is a more interesting subject than one might suppose. As evidence, I submit some headings from an avian-control monograph dug up by my assistant Una: "Shotguns and Rifles with Live Ammunition"; "Pyrotechnics"; "Rockets and Mortars"; "Lasers." There's also a section titled "Scarecrows," which speaks disparagingly of traditional devices but more warmly of "a human-like scarecrow that popped up from a double propane cannon [which] was very successful in keeping blackbirds from feeding over 4-6 acres of sunflowers." And here we slicks thought farming was dull. Who knew? • There have been several studies of scarecrows, more commonly termed "mannequins" or "effigies" in the technical literature, presumably because it sounds more scientific. As one might deduce given the scarcity of actual working scarecrows, as opposed to the showbiz variety (seriously, have you ever seen one? ), the old-fashioned stuffed dummy doesn't accomplish much. One series of tests with mannequins protecting a simulated soybean field from doves found each scarecrow could protect between 0.03 to 0.06 acres. You'd need at least 16 scarecrows per acre, or more than 10,000 per square mile, and even then they'd lose effectiveness once the birds got used to them. • Some claim you can improve your scarecrows' effectiveness by tarting them up with reflective streamers or pinwheels, though little payoff has been documented for this. Getting more ambitious, you can rig them to move, make noise, or both. 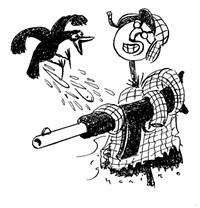 Lest you think the propane-powered version referred to above solves your bird issues once and for all, be aware that some species, blackbirds in particular, may display a maddening tenacity. 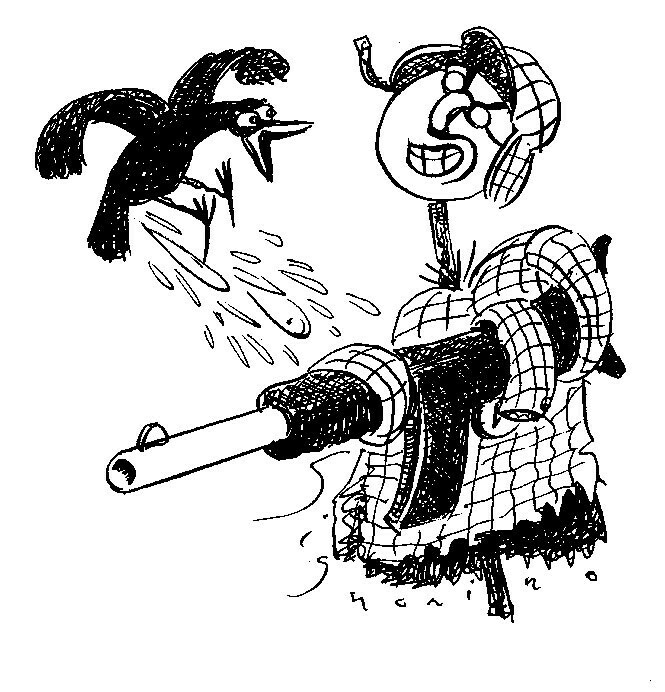 In one set of tests artillery-backed scarecrows reduced bird damage 84 percent, but in another it was just 8 percent. Population size may be a factor: one flock of blackbirds was estimated to number 46,000, which may not recall the glory days of the passenger pigeon but is still a lot of birds. • As you may deduce from the tenor of the discussion up to this point, in bird-shooing, the smart money's on shock and awe, although selective slaughter also has its advocates. For example, in the discussion of live ammunition referred to above, we learn that shooting at and thus killing unwanted birds is a common control strategy but "is done mainly to reinforce the effectiveness of non-lethal bird scaring devices that are also in use." In other words: bird terrorism. The experts, you'll (I hope) be pleased to note, don't think much of this plan's deterrent value, in part because with live ammo the noise is loudest at the gun. In contrast, pyrotechnics, the preferred technology, delivers the noise to the birds. • Other bird-scaring options include aircraft-engine noise, horns and air-raid sirens, electronic noisemakers of various kinds, broadcast predator calls, hawk kites and balloons, stuffed predators, real predators (falcons), radio-controlled model aircraft, dyes, smoke, chemical repellents, magnets, water spray, microwaves, and—remember this one—tall grass. • Habitat modification. An example described at length is the above-mentioned tall grass, which many (though not all) bird species avoid because it hides both food (worms and such) and predators. One concedes that in suburbia tall grass around the homestead isn't going to endear you to the neighbors. • Physical barriers. The following method has a certain grim interest: an overhead grid of monofilament line spaced at intervals of anywhere from 1.5 to 12 meters. Although the gaps are wide enough for birds to pass through, the grid's "deterrent effect ... is quite pronounced," we read. What's more, it stays pronounced—that is, the birds don't become blasé about the grid—for a reason that a moment's thought will make obvious: "The unexpected encounter of a bird with a thin, difficult-to-see line has a startling effect." Too cruel? Another recommendation from Harris and Davis is bird balls, which isn't the schoolyard insult juvenile minds may imagine but rather is the practice of concealing bodies of water with a surface layer of four-inch plastic spheres, which, aesthetics-wise, does a real number on the koi pond. • Good old shock and awe, including pyrotechnics and shooting. Falcons and broadcast distress calls also get high marks but—you'll notice a theme here—tend to freak out the homeowners' association. Thus the dilemma evident to strategists since Machiavelli's day: politically acceptable but ineffective vs. drastic but does the job.